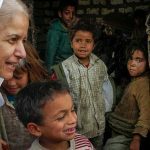 Individuals working on humanitarian causes, such as poverty and human rights, often are inspired and sustained by their spiritual beliefs and practices. Whether they are Buddhist, Muslim or Christian–or do not adhere to any particular tradition–their spirituality compels them to be engaged with the world. From CRCC’s first grant on the role of religion in the aftermath of Los Angeles’ 1992 civil unrest, CRCC’s research and training programs have sought to understand and support faith leaders committed to improving their communities. CRCC expands on its expertise with “Spiritual Exemplars: A Global Project on Engaged Spirituality.” Global in scope, the project will capture the stories of 100 exemplary individuals’ commitment to advancing human flourishing and establish a field of study around “spiritual exemplars.” Case studies, podcasts, short documentaries and written profiles will be gathered below, along with analysis. The project is supported by the John Templeton Foundation and Templeton Religion Trust. Sign up for CRCC’s newsletter to receive updates on the project, and click here to find out how you can get involved. Above, Maggie Gorban ministers to children in a slum on the outskirts of Cairo.